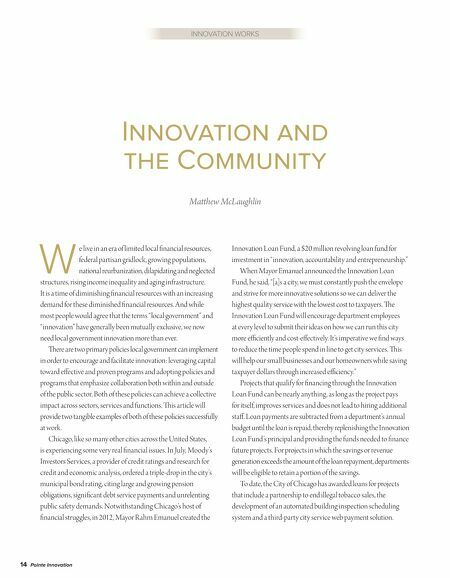 INNOVATION WORKS Innovation and the Community Matthew McLaughlin W e live in an era of limited local financial resources, federal partisan gridlock, growing populations, national reurbanization, dilapidating and neglected structures, rising income inequality and aging infrastructure. It is a time of diminishing financial resources with an increasing demand for these diminished financial resources. 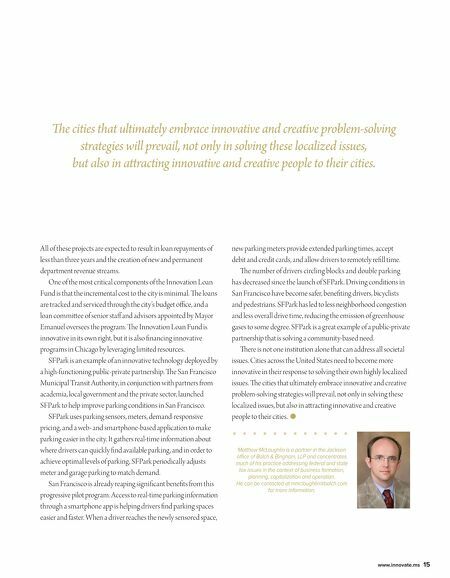 And while most people would agree that the terms "local government" and "innovation" have generally been mutually exclusive, we now need local government innovation more than ever. There are two primary policies local government can implement in order to encourage and facilitate innovation: leveraging capital toward effective and proven programs and adopting policies and programs that emphasize collaboration both within and outside of the public sector. Both of these policies can achieve a collective impact across sectors, services and functions. This article will provide two tangible examples of both of these policies successfully at work. Chicago, like so many other cities across the United States, is experiencing some very real financial issues. In July, Moody's Investors Services, a provider of credit ratings and research for credit and economic analysis, ordered a triple-drop in the city's municipal bond rating, citing large and growing pension obligations, significant debt service payments and unrelenting public safety demands. Notwithstanding Chicago's host of financial struggles, in 2012, Mayor Rahm Emanuel created the 14 Pointe Innovation Innovation Loan Fund, a $20 million revolving loan fund for investment in "innovation, accountability and entrepreneurship." When Mayor Emanuel announced the Innovation Loan Fund, he said, "[a]s a city, we must constantly push the envelope and strive for more innovative solutions so we can deliver the highest quality service with the lowest cost to taxpayers. The Innovation Loan Fund will encourage department employees at every level to submit their ideas on how we can run this city more efficiently and cost-effectively. It's imperative we find ways to reduce the time people spend in line to get city services. This will help our small businesses and our homeowners while saving taxpayer dollars through increased efficiency." Projects that qualify for financing through the Innovation Loan Fund can be nearly anything, as long as the project pays for itself, improves services and does not lead to hiring additional staff. Loan payments are subtracted from a department's annual budget until the loan is repaid, thereby replenishing the Innovation Loan Fund's principal and providing the funds needed to finance future projects. For projects in which the savings or revenue generation exceeds the amount of the loan repayment, departments will be eligible to retain a portion of the savings. To date, the City of Chicago has awarded loans for projects that include a partnership to end illegal tobacco sales, the development of an automated building inspection scheduling system and a third-party city service web payment solution. Could Mississippi be the Next Hollywood?